Imagine you're a scuba diver, and you need to calculate the air capacity of your tank. Or imagine you've blown up a balloon to a certain size, and you're wondering what the pressure is like inside the balloon. Or suppose you're comparing the cooking times of a regular oven and a toaster oven. Where do you start? All of these questions have to do with the volume of air and the relationship between air pressure, temperature and volume. And yes, they are related! Fortunately, there are a number of scientific laws already worked out to deal with these relationships. You just have to learn how to apply them. We call these laws the Gas Laws. Boyle's Law: P1V1 = P2V2. Charles' Law: P1 ÷ T1 = P2 ÷ T2, where T is in Kelvin. Combined Gas Law: P1V1 ÷ T1 = P2V2 ÷ T2, where T is in Kelvin. Ideal Gas Law: PV = nRT, (measurements in SI units). Boyle's Law defines the relationship between a gas volume and its pressure. Think of this: If you take a box full of air and then press it down to half its size, the air molecules will have less space to move around and will bump into each other much more. These collisions of air molecules with each other and with the sides of the container are what create air pressure. Boyle's Law doesn't take temperature into consideration, so the temperature must be constant in order to use it. Boyle's Law states that, at a constant temperature, the volume of a certain mass (or amount) of gas varies inversely with the pressure. where P1 and V1 are the initial volume and pressure and P2 and V2 are the new volume and pressure. Example: Suppose you're designing a scuba tank where the air pressure is 3000 psi (pounds per square inch) and the volume (or the "capacity") of the tank is 70 cubic feet. If you decide you'd rather make a tank with a higher pressure of 3500 psi, what would the volume of the tank be, assuming you fill it with the same amount of air and keep the temperature the same? 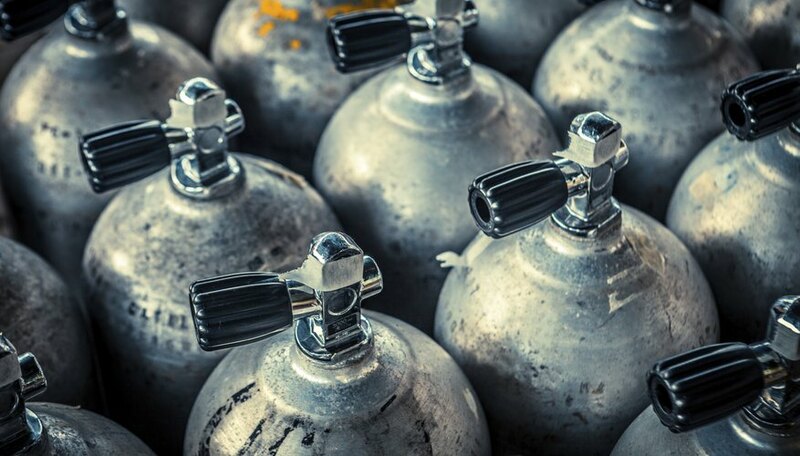 So the second version of your scuba tank would be 60 cubic feet. What about the relationship between volume and temperature? Higher temperatures make molecules speed up, colliding harder and harder with the sides of their container and pushing it outward. Charles' Law gives the math for this situation. Charles' Law states that at a constant pressure, the volume of a given mass (amount) of gas is directly proportional to its (absolute) temperature. Or V1 ÷ T1 = V2 ÷ T2. For Charles' Law, the pressure has to be held constant, and temperature should be measured in Kelvin. Now, what if you have pressure, temperature and volume all together in the same problem? There's a rule for that too. The Combined Gas Law takes the information from Boyle's Law and Charles' Law and meshes them together to define another aspect of the pressure-temperature-volume relationship. P1V1 ÷ T1 = P2V2 ÷ T2. Again, temperature should be measured in Kelvin. where P = pressure, V = volume, n = number of moles, R is the universal gas constant, which equals 0.0821 L-atm / mole-K, and T is the temperature in Kelvin. In order to get all the units correct, you'll need to convert to SI units, the standard units of measurement within the scientific community. For volume, that's liters; for pressure, atm; and for temperature, Kelvin (n, the number of moles, is already in SI units). This law is called the "Ideal" gas law because it assume that the calculations deal with gases that follow the rules. Under extreme conditions, like extreme hot or cold, some gases may act differently than the Ideal Gas Law would suggest, but in general it's safe to assume that your calculations using the law will be correct. Now you know several ways to calculate air volume under a variety of circumstances. Hansen, Elise. "How to Calculate Air Volume." Sciencing, https://sciencing.com/calculate-air-volume-5146908.html. 20 June 2018.